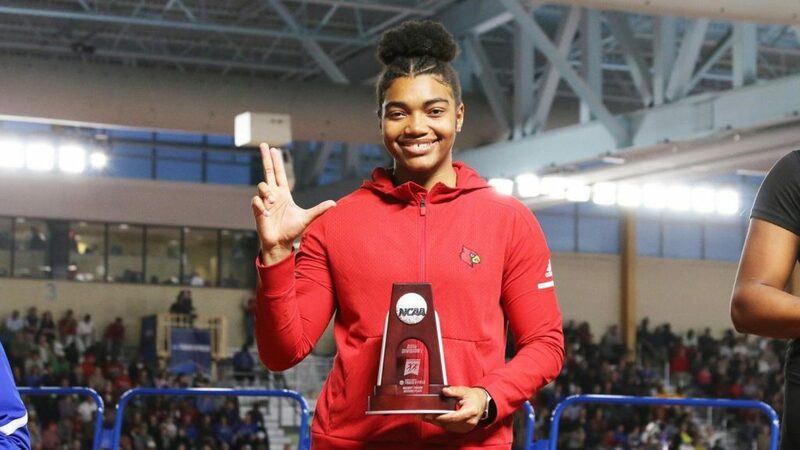 Louisville sophomore Makenli Forrest placed second in the weight throw at the 2019 NCAA Indoor Championships. Following a fourth-place finish at the ACC Indoor Championships, women’s track and field sent Makenli Forrest and Dorcas Wasike to the NCAA Indoor Championships in Alabama. Both Cardinals competed hard and earned All-American honors for their performances. Forrest capped a standout sophomore season in the weight throw with second place at the NCAAs. She began competition in Birmingham ranked eighth nationally in the weight throw, underscoring the significance of her high-level performance. Through the current season, Forrest has won the weight throw four times and finished in the top four of all six of Louisville’s meets. She threw a personal-best 22.54m/73-11.50 in the final round of the NCAAs to grab second place and first-team All-American honors. “Her future is bright and I look forward to having the opportunity to continue working with her over the next few years,” Cowper said of Forrest. Also distinguishing herself alongside Forrest was Wasike. The redshirt sophomore finished ninth in the 5,000 meters for her first appearance at the NCAA Championships. Wasike ran well at the ACC Championships a couple of weeks before, finishing second in the 5,000 meters and first in the 3,000 meters. She ranked fifth in the nation in the 5,000 meters prior to the NCAAs, though coach Cowper said Wasike’s ninth-place finish is still a high accomplishment. Wasike earned second-team All-American honors for her performance, officially becoming a two-time Cross Country All-American, an Outdoor Track All-American and now an Indoor Track All-American. The track and field team recently began its outdoor season with 14 wins at the Houston Spring Break Invitational. Louisville will travel to meets in Austin, TX; Raleigh, NC; Oxford, MS; and Knoxville, TN, before hosting the Louisville Invitational April 12-13.